It is a New Year, 2011, war is raging, hatred abounds, greed is rewarded with power, love is reviled as filth. Good people need to be vigilant, paradoxically to fight for peace. Take a minute to play this simple anthem and contemplate it. Here is a photograph of the Imagine Peace Tower, located on Viðey Island in Kollafjörður Bay near Reykjavík, Iceland. In 1967, John Lennon invited Yoko Ono to his house to ask her if she could build this light house, which was really only a whimsical expression of conceptual art and never intended to be constructed in reality. The Imagine Peace Tower was lit on October 9, 2007, powered entirely by geothermal energy. 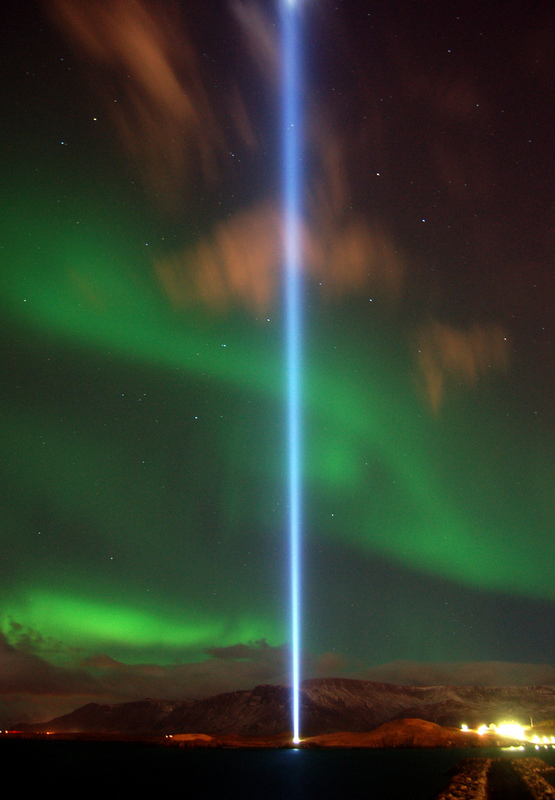 It is a tall shimmering tower of light that is visible from October 9th (John Lennon’s birthday) until December 8th (the anniversary of his death). In addition, according to their web site, the Tower will illuminate from Winter Solstice (December 21st – 28th), on New Year’s Eve (December 31st) and the first week of spring (March 21st -28th). It is lit from 2 hours after sunset until midnight, and until dawn on New Year’s Day. Let's imagine peace in 2011 and learn how to bring it to reality. The entirety of the liberal agenda. "imagine there's no beam of light"
The history of so-called civilization is the history of armed conflict. My wife is currently reading the new biography of Cleopatra, and that has brought our discussions back to the brutality of the Mediterraean basin from the rise of Persia, Persia's defeat by the Greeks, and then the Roman defeat of the Greeks. No one with any sense of humanity wants this cycle to continue. Yet, how can we stop it? If anyone wants to have a real discussion -- not a series of snarky comments -- let's start with Afghanistan, a place where (it seems) there are NO good choices. On the one hand, we are engaged in a military/nationbuilding struggle in which it seems impossible to prevail, given the corruption of the supposed central government. On the other hand, it appears that leaving Afghanistan would lead to the return of Taliban terror, including the total subjugation of all women, and the provision, once again, of a safe haven for Al Qaeda intent on attacking the United States -- and, this time, a safe haven for allied Pakistani fundamentalists intent on toppling an ineffectual (and, apparently, corrupt) government that possesses nuclear weapons. Given the stakes, but also given the insanity and brutality of war, what is the wisest course of action? How do we, as citizens, assess this mess with clear eyes? How do we, in this world, "give peace a chance"? "since the creation of the world God’s invisible qualities—his eternal power and divine nature—have been clearly seen, being understood from what has been made"
btw, could it be that gays are attracted to the artificial because they are opposed to nature? "The history of so-called civilization is the history of armed conflict." "My wife is currently reading the new biography of Cleopatra,"
"No one with any sense of humanity wants this cycle to continue. Yet, how can we stop it?" we need to replace "peace" with a concept more like "shalom"
"If anyone wants to have a real discussion -- not a series of snarky comments -- let's start with Afghanistan"
"Given the stakes, but also given the insanity and brutality of war, what is the wisest course of action?" How is the concept of "peace" different from the concept of "shalom"? But, more to the point, Anon says that that Afghan and Pakistani domestic affairs are "none of our business." But the problem is that the outcomes there actually would impact on our national security. Perhaps one question is whether we have the capacity to determine the outcome. If we do not, then we must be prepared to adjust to the consequences in terms of international terrorism and, most signficantly, in terms of terrorist access to nuclear weapons. That may be something we will have to cope with. But we should not pretend that that the problem would not exist.